I was sitting with my sister under the wall of a half-ruined house when a soldier from the Red Army came up to me and asked me something in an unknown to me language. As a reply, I asked him in Russian: “I do not understand what you say”. And the soldier answered also in Russian: “Are you Armenian?”. “No”, I replied, “I’m Jewish”. And this was the beginning of a new family’s story; a family that had to exchange a life full of tortures and severe trials to happiness. Petros Chernamoryan, born in Leninakan (nowadays renamed to Gyumri) and the Red Army soldier of Armenian Soviet Socialistic Republic, was already 3 years serving in a division providing service to the military airplanes. After the end of the war, the division moved from Poland to Ukraine, region Khmelnytsky and city Krasliov, where young Petros Chernamoryan met his future wife, Jewish by nationality, Sofya Jakov Barim. During the very first meeting, Petros had told Sofya that he’ll take her to Caucasus. 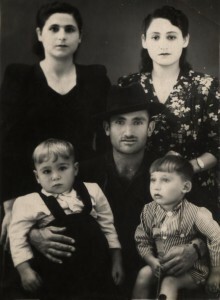 In 1946, Sofya and Petros left for Armenia together with the sister of Sofya, Olga Barim (born 1919). Jakov Barim lost his wife too early, in 1932 when Sofya was only 3 years old during Stalin repressions, dispossession of kulaks and, as a result, the wealthy family became a simple citizen of a socialistic republic. The sudden war brought new trials to this family. The Barims were 5 sisters – Clara, Rosa, Olga, Raya and Sofya. When the war started, Rosa, Raya and their husbands were in the Far East. But Olga and Sofya managed to escape from the fascist occupation in 1941. “After 3 months staying in cargo train carriage without food and clothes, under day and night continuous bombings of fascist fighters, we hardly managed to get to Kazakhstan. I was too young; neither graduated from the school nor received an education. Was working in cotton plantation, washing dishes in canteens and as a 12 years old, I was not paid for the work done. I lost my father in 1941, my elder sister Clara and her whole family. We managed to find my father with the help of the letter to Moscow and when we returned to Krasilov in 1945, found our burnt house and the neighbors told us my sister and her husband Juja Moskovets and their child where tortured by fascists for being Jewish, later being buried alive in a deep hole dug for them. Only four sisters and our father survived from our whole generation. All other our relatives (I had uncles, cousins and others) were killed by nacists”- remembers Mrs. Sofya. “Only Petros was helping me, as I had no one but him and my sister. He stayed in Krasilov 1 year. And when he was discharged from the army, my sister Olga and I left to Armenia with him”. Love and devotion of the young Armenian towards this Jewish girl saved her from starvation, as many people where dying from hunger during this period. Olga stayed 15 days in Armenia, city Leninakan and then returned to Krasilov. I was able to get information about my relatives only with the help of letters. I gave birth to 3 sons; Arshak born in 1948, Sashik in 1950 and Artush – 1954. I learned Armenian with my sons. The family formed by the people for two nations that had suffered a lot, should probably be happy, but destiny had another experience kept for them. Sashik Chernamoryan passed out when he was 36 years old, and 2 years later Sofya’s husband and elder son Arshak died during the horrible Spitak earthquake in 1988, both of them at their working place. Sofya Chernamoryan (Barim) lives now in Israel, Kiryat Gat with her son Artush Chernamoryan. Grandchildren of Sofya have received the permission to settle in Israel – their grandmother’s real homeland. This generation, born as a result of Armenian-Jewish unity, will drop new seeds in the Holy Land and always keep in remembrance their tormented ancestors. Previous article: Sousa Mendes saved more lives than Schindler so why isn’t he a household name too?